Longtime Ernie Ball Music Man family member Steve “Luke” Lukather is a legend in the world of rock and pop music. His long and illustrious career includes numerous highlights such as: being the most sought-after musician in the intensely competitive LA studio recording scene; being the lead guitarist and at times frontman for the multi platinum selling rock group Toto; and being a seasoned veteran of innumerable worldwide tours. Luke also provided the input to design one of Ernie Ball Music Man’s most beloved and best selling signature guitar lines: the Luke collection. Let’s take a look at the evolution of The Luke through the years. In the late ’80s and early ’90s a friendship between Luke and Sterling Ball had sprung up, and naturally a signature guitar emerged. The Luke I, as it is now known, established the blueprint of Luke guitars to come. The design inspiration came from Luke’s desire to meld his favorite aspects of the Gibson Les Paul and the Fender Stratocaster, including a HSS pickup configuration. Luke I models are distinguishable by their Music Man produced FR locking tremolo and EMG SA57 single coil pickups, as well as the Pearl Blue and Pearl Red finishes limited to the Luke I’s run. The now-standard version of the Luke signature model is commonly referred to as the Luke II. The Music Man locking tremolo was switched out for a Music Man vintage tremolo, which is set up in a “floating” configuration to better aid Luke’s signature whammy bar technique. New EMG SLV custom single coil pickups were added, along with a second knob for tone control. The finish options for the original run were either Luke Blue or Luke Candy Red, though more options were available periodically over the years. Designated by the “LIII” marking on the headstock, Luke III models are the most recent evolution in the Ernie Ball Music Man Luke signature guitar line. Features include a 3% larger body, a brand new two humbucker pickup configuration using Luke’s custom DiMarzio Transition humbuckers, and a gain boost housed in the push/push volume knob. Black and Bodhi Blue rounded out the finish options available. Available in either standard Luke or Luke III configurations, the Luke BFR models feature optional premium bookmatched maple or koa wood tops in addition to Music Man’s premium Mahogany Tone Block. Guitars in the Luke BFR series are also distinguishable by their premium translucent Blueberry Burst or Hazel Burst finishes. Available in either dual-humbucker or hum-single-single pickup configurations, the extremely limited edition Luke III BFR in Tumescent finish features a bound ebony fretboard and matte black hardware. 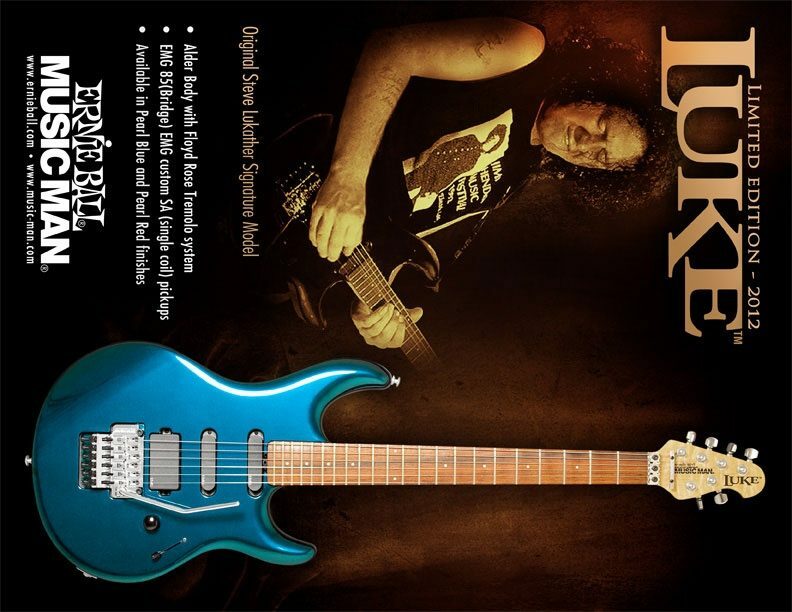 Each guitar also comes complete with a signed backplate from Steve Lukather himself, along with a hand-signed and numbered certificate of authenticity. Most Luke fans are aware of his famous work on Michael Jackson’s Thriller album, but that’s just the tip of the iceberg. Luke has provided rhythm guitar and solos for smash hits such as Don Henley’s Dirty Laundry, Forever Man by Eric Clapton and many more. His body of work is so extensive and varied that if you tally up the sales of albums he’s worked on, it exceeds well over 100 million records sold. In the course of Luke’s career, he’s also ventured outside of the rock and pop radio spectrum. From working with country legends Chet Atkins and Dolly Parton, and even performing on soul music classics by Earth, Wind & Fire, Luke’s influence can be heard far and wide. From Cheech & Chong to This Is Spinal Tap, Lukather has lent his guitar talent to both Hollywood hits and cult classics. In fact, during the height of their seminal album Toto IV‘s success in 1984, Steve and the other members of Toto took the time to compose the score for David Lynch’s epic film Dune. Keep in mind this all just a small sampling of the depth of musical accomplishment and versatility to Luke’s name. To see and hear his talent in person, catch him live with Toto on the Toto World Tour 2017 beginning this summer. To stay up to date you can find Luke’s touring schedule at his website, or find him on Facebook and Twitter.